Across the nation, regional and state farm organizations are actively engaged in the push for state renewable energy and fuel standards. 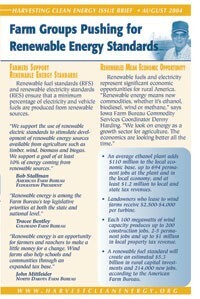 Already, sixteen states have enacted standards to grow markets for renewable electricity. Farm organizations, by representing the common voice of agriculture, have tremendous influence that can make all the difference in growing the renewable energy economy. Download the report.